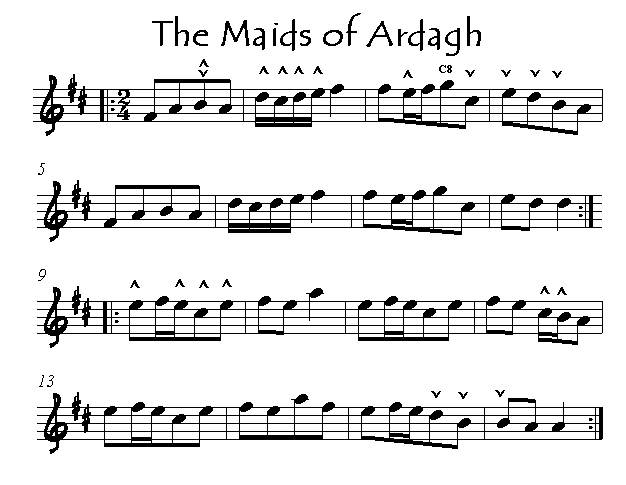 In The Maids of Ardagh most of the notes in bars 1 and 2 are on the draw, whereas in bars 3 and 4 they are on the press. As mentioned above, having passages of notes in a single direction promotes fluency by reducing bellows changes. Note also in bar 3 that I recommend playing the g on the C row at button C8, not at button G6. This is because the following note is a c# played with the right index finger, which would have to shift across 2 rows to play 2 notes in a row. Sometimes on the concertina we have to do this, but it is to be avoided wherever possible by alternate fingerings. By shifting the g to C8 it is played with the right 4th finger, which makes the shift to the c# smoother. I have inserted no arrow markings for bars 5-8 because they are a repetition of the first 4 bars. Now the B part of the tune is played mostly on the draw, but we reverse the bellows in bars 12 and 15-16. Again I have not notated bars 11 and 13 because they are identical with bar 9.